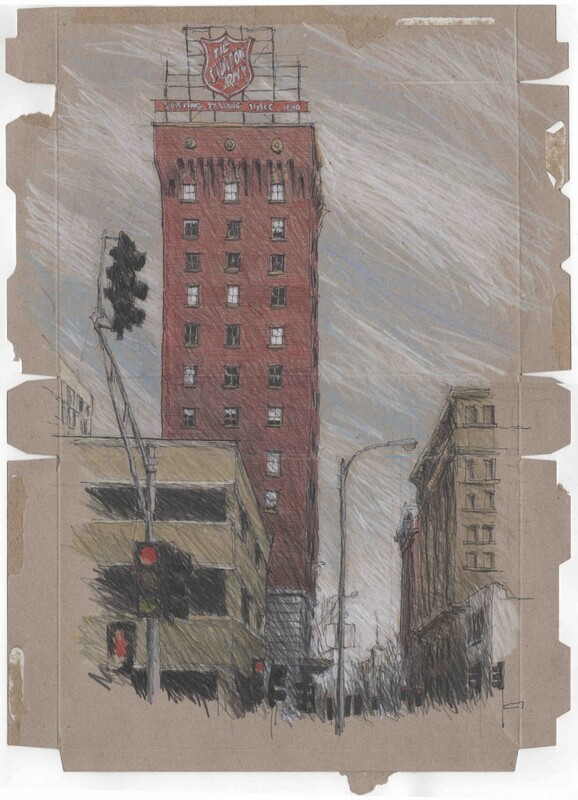 After a visit to St. Louis, architect Peter Rush of Sydney, Australia sent me a couple sketches he had completed during his Midwest road trip, including the image of the Chemical Building and 705 Olive below. I was mesmerized. I asked Peter if he wouldn’t mind sharing more of his experience in St. Louis. Here’s what he had to say. Enjoy! 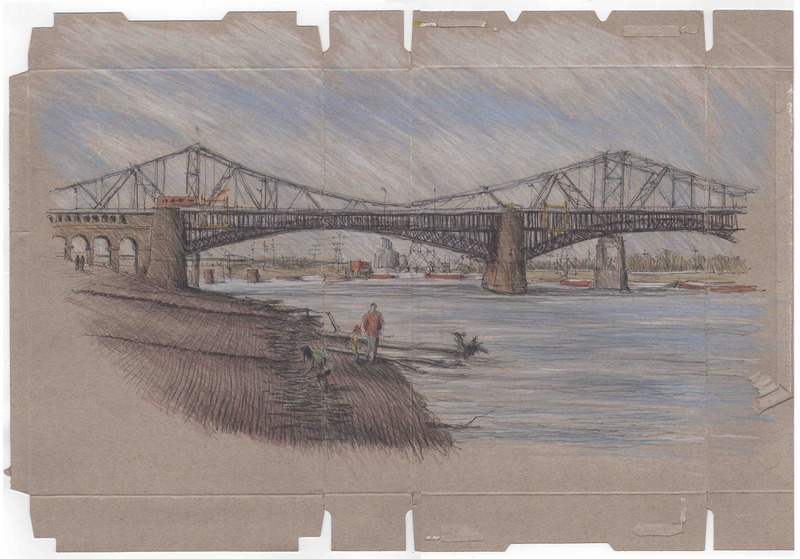 I would like to share with you drawings from my recent but too short visit to St. Louis. I am an architect from Sydney, Australia and I was on a road trip exploring the Midwest. This came about because I was invited by the College of Architecture and Planning at Ball State University in Muncie, Indiana to exhibit my mostly urban drawings of Sydney. 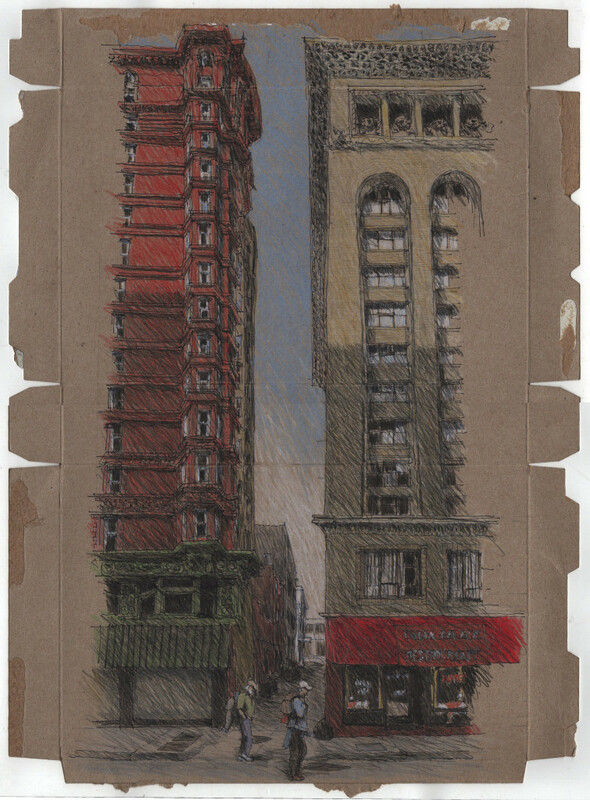 The invitation to exhibit was a great surprise and it gave me the opportunity for a three week architectural and sketching tour of the Midwest. 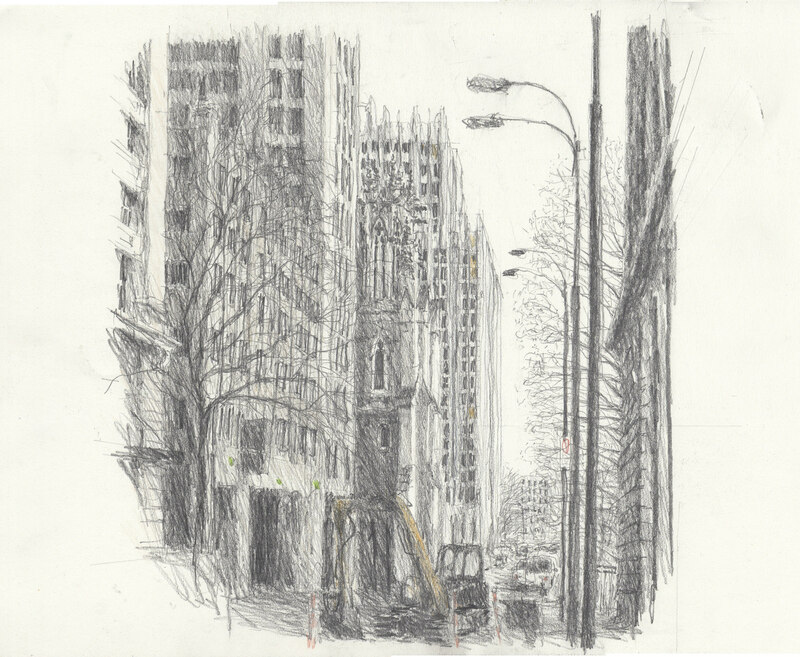 My sketches are recordings of urban spaces to feel and understand the place I am experiencing. It is a great way to observe and enjoy architecture. Often when traveling I will leave my camera at home and only draw. 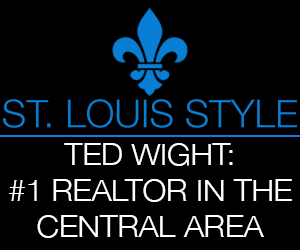 Arriving in St. Louis, I parked my rental car on Washington Avenue with the first objective to find the Wainwright building by Louis Sullivan. Finding it confirmed every perception I had of this beautiful building. What I did not anticipate was that St. Louis is a city of great streets and wonderful buildings. 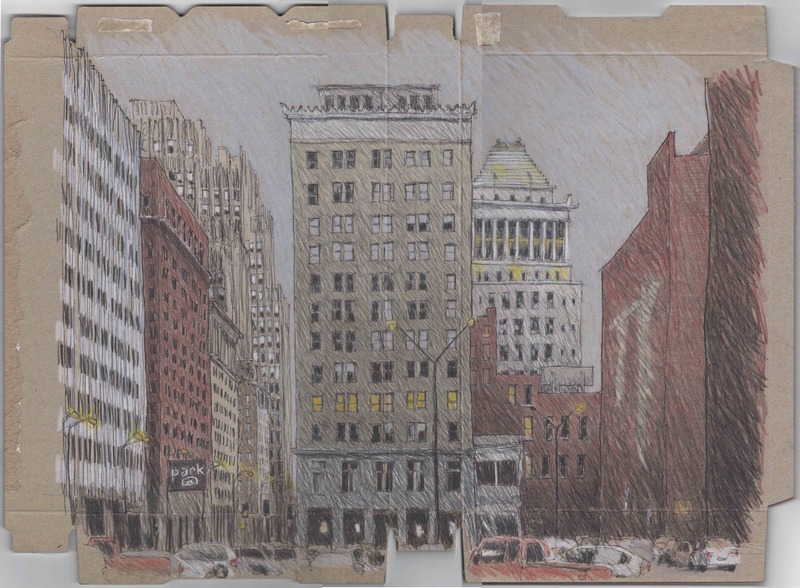 With the Wainwright Building out of the way I backtracked to places I had spotted to start some sketching. I couldn’t resist this break in the buildings along Washington Ave, I love these buildings, I’m always a sucker for big urbanity. I often sketch on the inside face of opened cereal boxes, color goes on well. I like the character it gives a finished drawing and the mechanical form of the box cut out working together with the urban spaces. 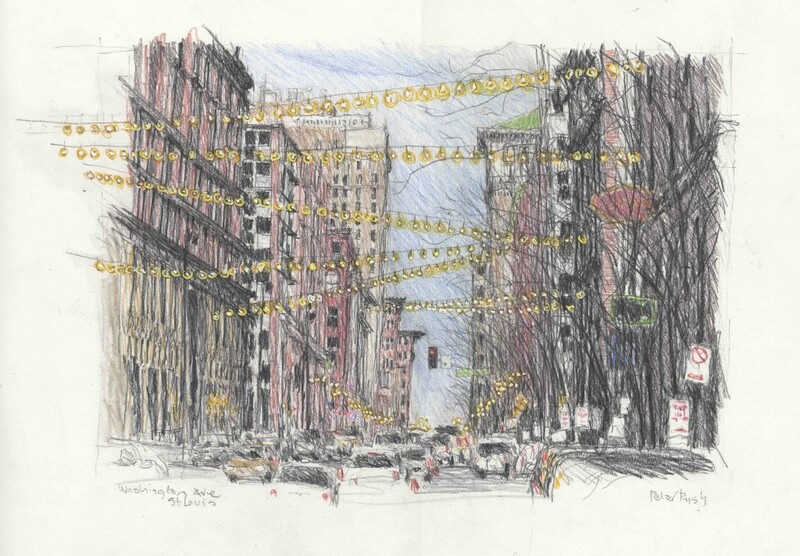 There are a thousand drawings you could do from Washington Avenue. This one is two blocks up from my previous sketch. 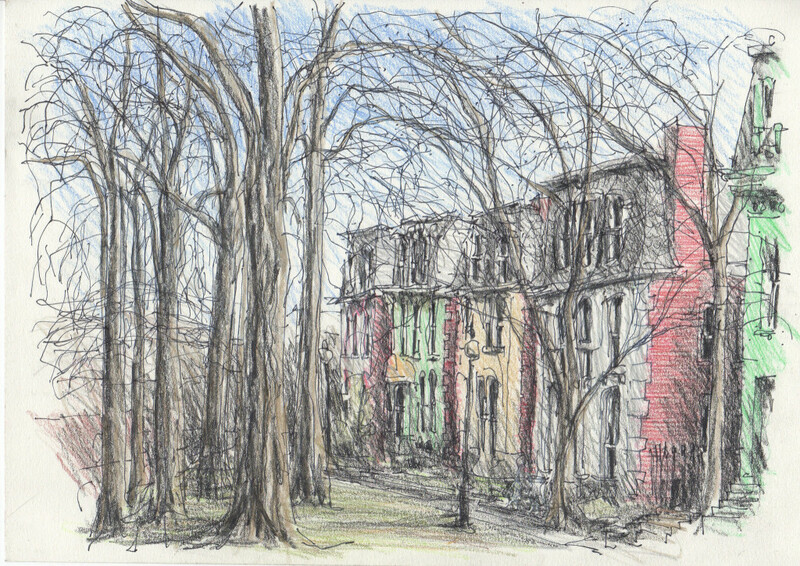 The street here looked so serene and dignified it called for a soft pencil drawing with plenty of deep shadows to show the spatial depth. I don’t do this type of drawing very often, even though most of the time I feel more satisfied with the result. The main reason is that you have to be so damn careful to avoid smudging them during and after. With this sketch I stood there for some minutes completely in wonder at these great buildings. But how can I draw them? The scale, the quiet of the street, that gap, the glowing light above the deep shadows. To complete the drawing, these two men slowly walked by, very intriguing, homeless clearly, but independent and passing through. A question came to me, how possibly can such significant buildings sit empty? The light on the wedding cake like Southwestern Bell Building was beautiful and fading quickly. Too interesting not to sketch, so this drawing had to be a quick one. 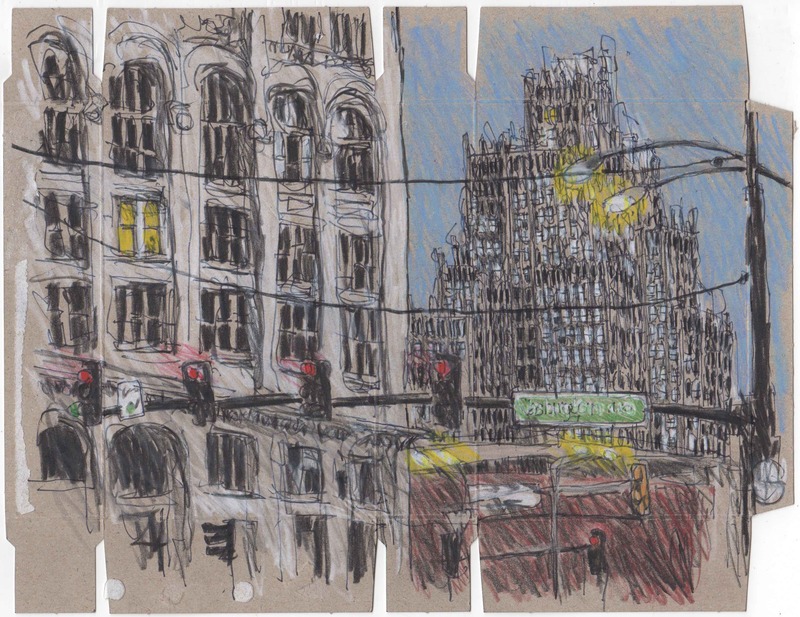 Washington Avenue, I am back at the car and one last drawing to finish a busy day. What a great street! The next morning on the way back to my car after taking a look at the magnificent vaulted ceiling at St. Louis Union Station, I spotted this very simple building with a great sign. I really liked the strength and economy of this building, built like a fortified tower. Here is Benton Place, so beautiful. When I sketch I want to express the spatial qualities of a place. With Benton Place, it was the lovely space between the trees and the houses that got my attention. My last sketch from St. Louis. It was a beautiful day, I visited the Gateway Arch and walked down to the embankment to have a good look at the Mississippi and the Eads Bridge. It would be great to come back to St. Louis and get to know the city better. I hope my these sketches show to a some small extent the rich architectural heritage that captivated me the moment I arrived.